Not all programmers need to get their hands dirty and have to dig deep into what exactly their applications or services are doing at a lower/network level. This is why programmers work with programming languages, as they provide a nice high-level abstraction layer that protects us from a lot of these concerns. But regardless if you’re a client-side developer or a server-side developer, at some point your application will start misbehaving and it can be useful to have experience using command-line/terminal based tools to help you debug what’s going on. That is what I want to briefly cover today: a few select programs that you may find useful to have in your debugging toolbox. I won’t claim to be an expert with any of these, but I’ve had to use these tools at some point or another so I at least know what I have available to me whenever things start going haywire. I’d encourage you to do follow-up reading once you’ve gone through this post, and to experiment with these tools if there are any in particular that you find interesting. You are going to find that some of the tools I mention, have a lot of crossover behaviour between them. One of the main points of confusion for people, when given the choice of lots of different utility tools, is: when/why should I use this over another very similar tool? The answer: it depends (as with everything in life). Sometimes it can just be a personal preference. You’re happy using tool x, which can sort of do that ‘thing’ you need it to, but maybe tool x isn’t quite as good at showing you the ‘thing’ as tool y (which was designed specifically to solve the ‘thing’ problem); but hey, tool x is good enough at it and it also allows me to inspect y and z problems (which are things I look at the majority of the time). Just be aware that that there will be crossover functionality, and that on occasions certain tools might only have slight additions that could be useful to you depending on the problem you’re trying to debug. It was brought to my attention by Aidy Lewis that tools such as ifconfig and netstat have since been deprecated in favour of other tools. See here for the details of what the replacement tools are. The fact is in order to use tools such as tcpdump, telnet or netstat you do need to understand the basics of how the TCP and HTTP protocols work in order to utilise these programs fully. As far as other tools are concerned, you may need to understand some networking basics. I mean, I know very little, but I know just enough to muddle along when I need to. I’ll be covering how I’ve used these tools but not really much more beyond that, so you may need to do some additional reading in order to appreciate what these tools offer (outside of my own experience with them). Finally, before we get going, it’s worth taking a moment to consider the OSI Model. What this model represents are the different layers of a system. From the very real hardware level (e.g. physical cables that make the interwebs work) right up to the software level. The reason this is useful, is because you can identify which layer the relevant tools are operating at. Tools like netstat operate at layer four (transport: tcp), whereas telnet operates at layer seven (application: it actually has its own protocol telnet). When debugging an issue, if you know the problem space is a particular layer of the OSI model, then you’ll have an easier time identifying which tool is best suited to the investigation. There are many different utilities, some provided as built-ins to your OS, others might be GNU flavoured or home grown (e.g. they can be built using a myriad of programming languages) and which you have to download separately. The ones listed below are a selection of tools I find particularly useful for different scenarios. But they’re not all available on the Mac OS (which is what I use, and which - I’m making a massive assumption - you are likely using too). I do provide basic installation instructions for some of the tools that aren’t available for the Mac OS (either natively or at all) and for those tools that aren’t available for your OS, I would recommend using Docker for testing them out. The top command displays processor activity and also displays tasks managed by the kernel in real-time. If you have a cluster of nodes that are setup to scale up based on either CPU or Memory usage, then your first starting point will be to jump onto a running instance and check the different processes running and what their consumption is. I mention the above non-Mac options because when debugging on a remote server, chances are you’ll need some of those details more. 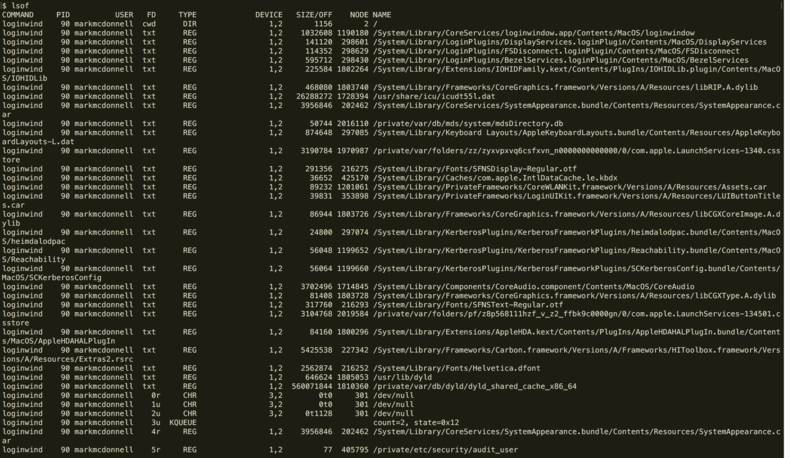 The ps command is useful for seeing ‘at a glance’ what process id’s have been provided to different programs and which user started them (as well as the relationship between processes). Majority of the time you’ll use ps just to identify the process id (pid) so you can then utilise another tool for inspecting the relevant process. The differences between ps and top are subtle, both display details about active processes (albeit in different formats). But top is continuous whereas ps is just a snapshop. The ps command also offers some more advanced display options, not just a table matrix, and these can help visualise the parent/children relationship for particular processes. So strace is awesome for understanding exactly what your application is doing. If you have (just for example) a Python or Ruby app, then you should know that all the function calls it makes are actually abstractions provided by the language. Most high-level languages are written in C, and so those abstracted functions will end up calling some internal C functions and those C functions will end up making OS level system calls. It’s these ‘system calls’ that you’ll end up tracing/tracking with strace. Now that’s better. We get a good overview of what syscalls have been made by the ls program, how many times and the overall time involved for each type of function. OK that output is a bit more practical, as we can see that the write syscall took approximately 66% of the overall time of the program to run. If this was your own application you might consider that an issue worth delving into more deeply. For debugging with strace I’d suggest using the -c flag first so you get a feel for any particular system calls that stand out as being quite odd. Maybe you notice a lot of network connections being opened and your app is showing signs of struggling with throughput. So you might then use strace without the -c so you could delve into the specific details. If you’re debugging on a remote server that’s running a web app, you might attach strace to the running server process and then start manually curling endpoints to see what sort of reaction the server has. As you can see strace is a really useful tool when the time comes. …and the time will come. By the way, you should be careful with backgrounded processes. If you attach to a backgrounded process running in the same shell instance as your strace execution, then you’ll be locked up. This means that lsof isn’t as pointless as you may have initially thought. Considering nearly everything in a *nix environment ‘is a file’ (including network sockets). This is one of those tools that might not get used very often, but when the right problem occurs it can be a real time saver being able to see what files your machine has open. 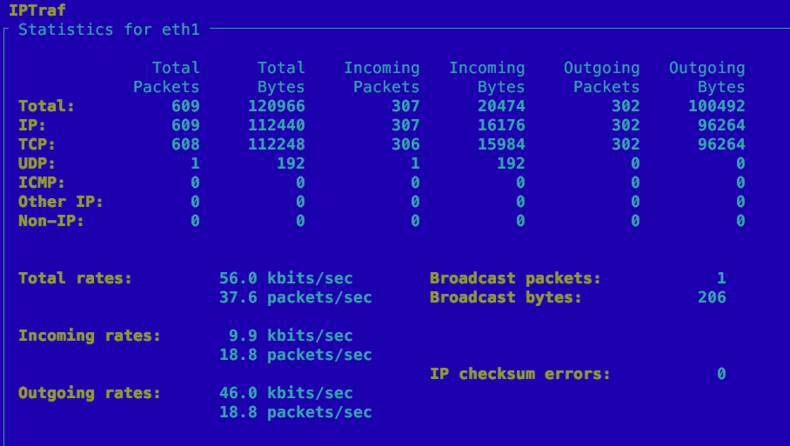 The netstat (network statistics) command is useful because it allows us to see network connections for TCP (both incoming and outgoing), routing tables, and a number of network interface and network protocol statistics. This gives us an insight into what network communications are going on and whether certain services are talking to the right endpoints, how often and whether their connections are being established or terminated correctly. 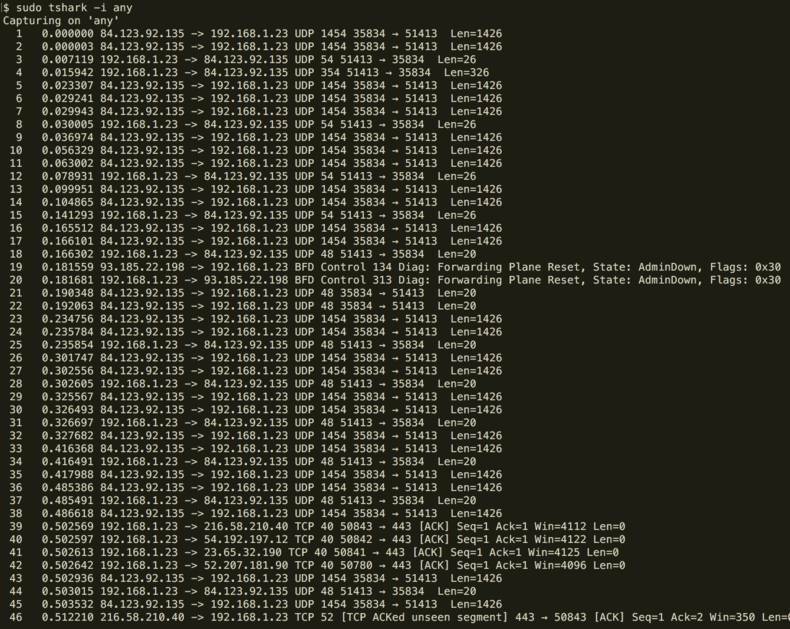 Effectively, if you’ve any kind of network issues, then this tool can help you potentially identify where it’s coming from or going (or if it’s not coming from or going to the expected source/destination). 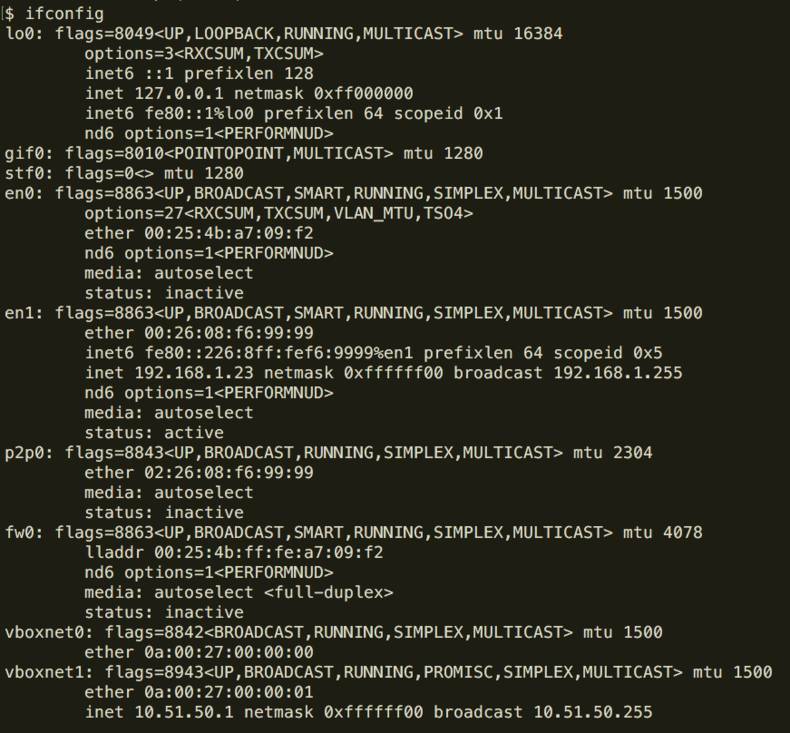 The ifconfig command is used to configure or review your network interfaces and can help you identify if there is a problem with your network (such as no Ethernet or WiFi or maybe your connections are misbehaving due to misconfiguration). The iftop command is useful for identifying things like “why is our connection so slow?”. It’s equivalent to a tool like top when understanding CPU usage. 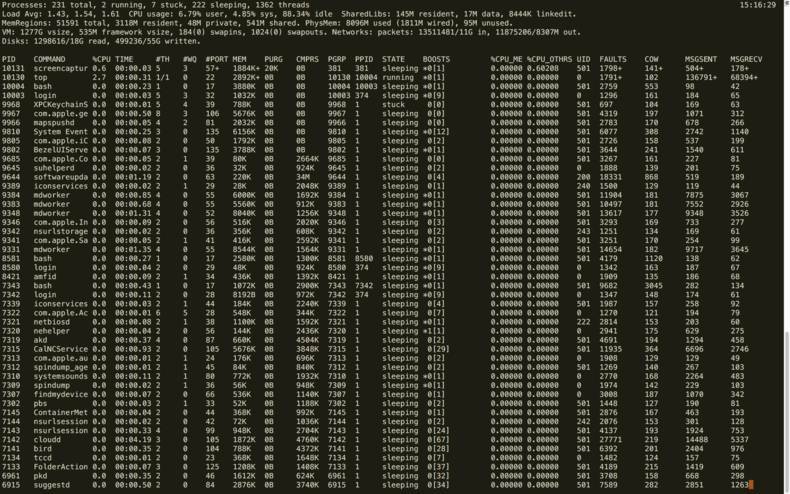 The command listens to network traffic on a named interface and displays a table of current bandwidth usage by pairs of hosts. Because iptraf requires a lot of user interaction to get into different sections of the tool, I’ll have to just leave it up to you to explore. But you’ll see options like IP traffic monitor, which can be useful viewing. Personally I don’t find iptraf as useful as tools such as iftop. But it’s here for you nonetheless. tcpdump is a powerful and widely used command-line package analyzer, which is used to capture or filter TCP/IP packets received or transferred over a network on a specific interface. We can save the output of this program into a pcap file format, that can then be viewed by either tcpdump itself or via an open source GUI based tool such as Wireshark that reads pcap format files and visualises the data. 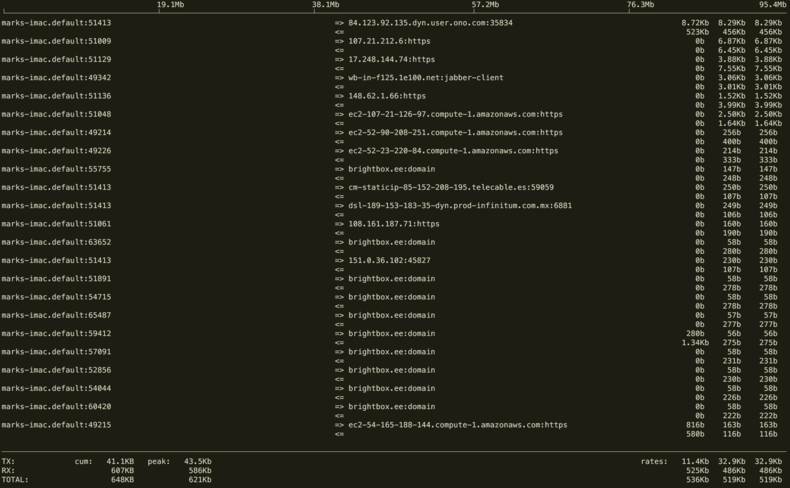 You’ll typically see more information within the ‘data’ output to indicate information about the packets being passed between hosts. One such example would be seeing win specified. This is a sliding ‘window’ that represents the size of the packets being sent back and forth. You’ll also typically see an ACK (acknowledgement packet), and that it won’t be sent until the previous packet has been completely received (this is to help with consistency of specific sequence numbers and the ability to signify packets have been missed). The win is also used for flow control. An example of this is where one end of the communication is having trouble keeping up with the number of packets and so they modify the window buffer to be a smaller packet size to allow themselves to catch up with their processing of data. Wireshark is a network protocol analyzer. It lets you see what’s happening on your network at a microscopic level. There’s not a lot I can say about Wireshark other than you really will need to know how certain network protocols (such as TCP) work in order to understand the output that’s being recorded. The output will look very similar to what tcpdump provides (depending on what network traffic you’re recording), and is a really useful tool for easier interrogation of pcap files created by tcpdump. Note: sometimes the flags that are available change. So I would suggest running the command brew cat wireshark first to see what’s available first. I typically have only ever used Wireshark with pcap files I’ve created via tcpdump so that’s what I’ll demonstrate here. There are two ways to open the pcap file in Wireshark. execute wireshark from the terminal, which will open the gui, and from the gui interface select “Open Capture File”. Every time there is (for example) a HTTP request, there might end up being 200 TCP packets recorded, which can be (as you could imagine) difficult to recognize and make sense of manually. But this problem can be simplified within Wireshark by clicking on “Statistics” and then “Conversations”, where it will organize all these disparate packets into TCP sessions for you. Thus making analysing the data much easier. Note: we cover ‘filtering’ more in the next section about tshark, but one simple search for a HTTP GET header in your recorded traffic is frame contains "GET"
Apparently --security-opt seccomp:unconfined is an alternative option. Doing this will allow Docker to access all devices on the host as well as set some configuration to allow the container to nearly all the same access to the host as processes running outside the containers on the host. For more details, please refer to the documentation. Tshark is a network protocol analyzer, but a terminal based one. As mentioned above in the Wireshark section, to get access to tshark on the Mac OS you need to install Wireshark. There are separate installs though for other OS’. I’ve only used tshark a few times and typically I find using the Wireshark gui better for interpretting tcpdump data (which has so far been one of my primary use cases; e.g. debugging traffic occuring on a remote server). 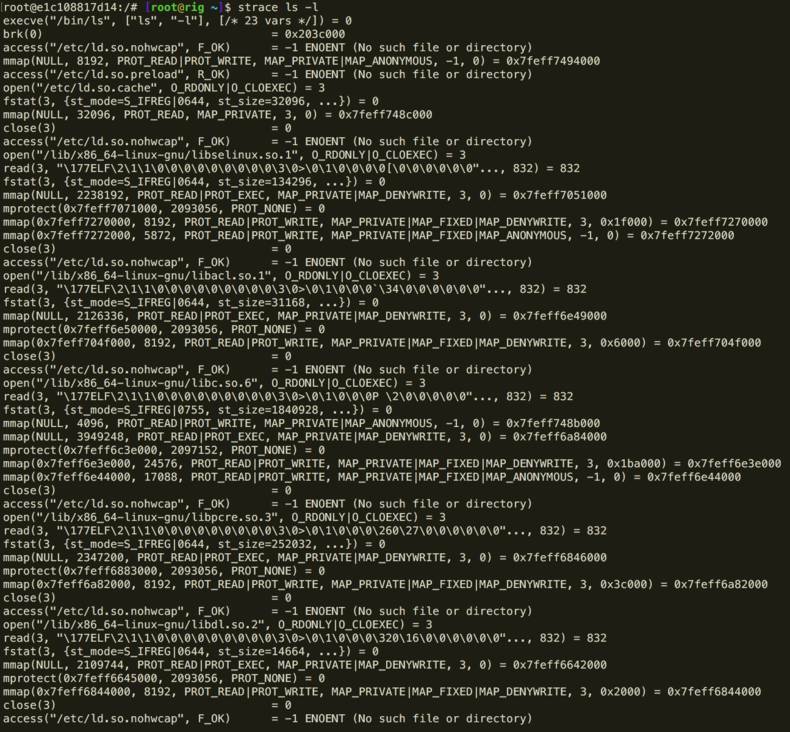 But the benefit of tshark, outside of those of us who love living inside the terminal, is the ability to automate analysis without the need for a gui. This means we can write scripts to process the data we’ve recorded and so becomes a very powerful tool. Also you can just run tshark and have it monitor all network traffic on your host machine or just a specific interface (using the -i flag). There is also the -D flag for having it show you all available interfaces you can listen on. In the above example we’re ‘explicitly’ listening on all interfaces for network traffic. We then filter out all packets except those which are a HTTP GET request. Now instead of just showing all the data for the HTTP GET requests that come through we use the -T flag to indicate that we’re interested only in ‘fields’ being displayed. We then can use the -e flag to indicate which subset of ‘fields’ we want to show. In this case we’ve chosen to display the request method (i.e. GET), the URI that was associated with the GET and the ip address associated with it. 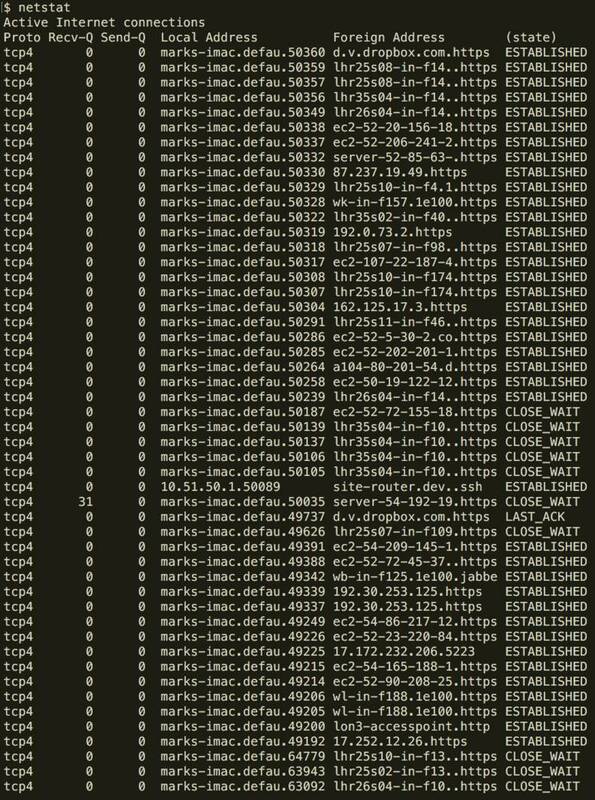 One very real example I had recently was the need to inspect DNS traffic and to identify the TTL record values returned by the DNS resolutions happening on port 53. One useful trick some people aren’t aware of, is that if you are writing automation scripts with tshark but you’re unsure of how to access specific data fields, then just use Wireshark temporarily to figure out the fields you need. 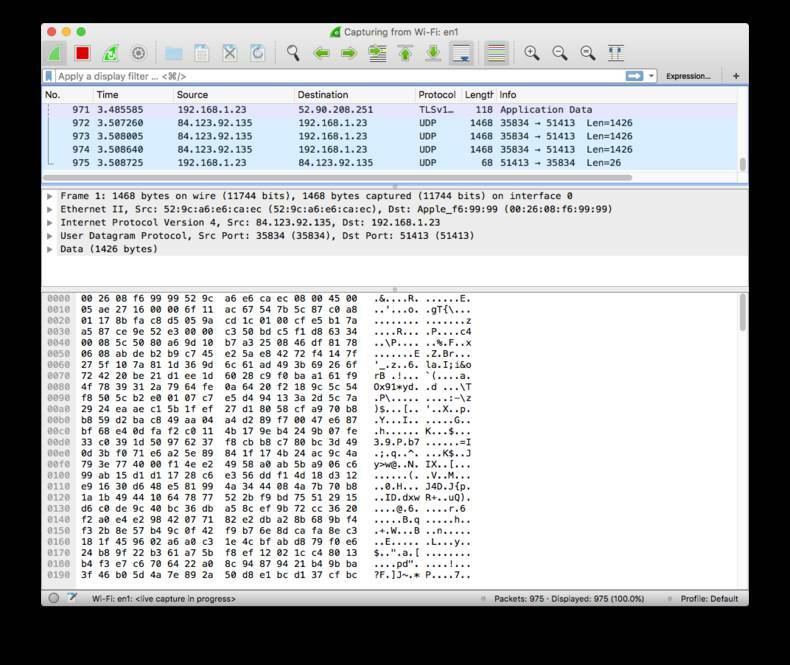 For example, if you open the pcap in wireshark, you can find the filter you need by selecting the data manually via the UI and then right-click’ing the relevant data field and selecting “Prepare a Filter > Selected”. This will generate the exact value you would assign to the tshark -e flag. Telnet is both a tool telnet and a Network Protocol of the same name: Telnet. The telnet program is used for interactive communication to a remote/external host on a given port. Once the connection to the remote host is established, an HTTP request can be sent to the host by typing it in the prompt. Telnet’s usage nowadays is a little limited due to the massive success of protocols such as SSH, but it can be interesting to play around with (although I’ve never really had much of a ‘need’ for it myself). To use the command you type telnet <host> <port>. Once ‘connected’ to the host you need to provide a command to be executed, for example a GET request. A few months after writing this article I stumbled across a similar (but much better) post from Julia Evans. I then realised she has written lots of amazing posts, so you should check them out. Obivously they all have their specialisms and unique features. I’ve not even scratched the surface of what they can do. If you know of anything really useful that I’ve missed, then let me know.